The big news this week was the hike in the cost of petrol. It has gone up 5.47 Rs to 63.4 Rs a litre (1 EUR a litre!). This affects everyone. Vehicle owners will be paying more to fill their tanks. Commuters will eventually face higher bus and auto-rickshaw fares. This may push some people to reconsider the way they get around. They may walk the few blocks to the post office instead of taking the car. Or they may consider cycling. This is becoming more and more popular in Bangalore, especially among the ‘techie’ crowd. They stand out on the city’s roads. While couriers and chai-wallahs totter along on their beat-up Atlas cycles, the techies zip past on their mountain bikes, helmet on head and backpack on back, on their way to Whitefield or Electronic City. Another common sight on Bangalore’s roads is the Reva. This tiny car can be seen but not heard, because it runs on electricity. Bangaloreans are proud of the Reva, because it was designed, developed and built in Bangalore only. 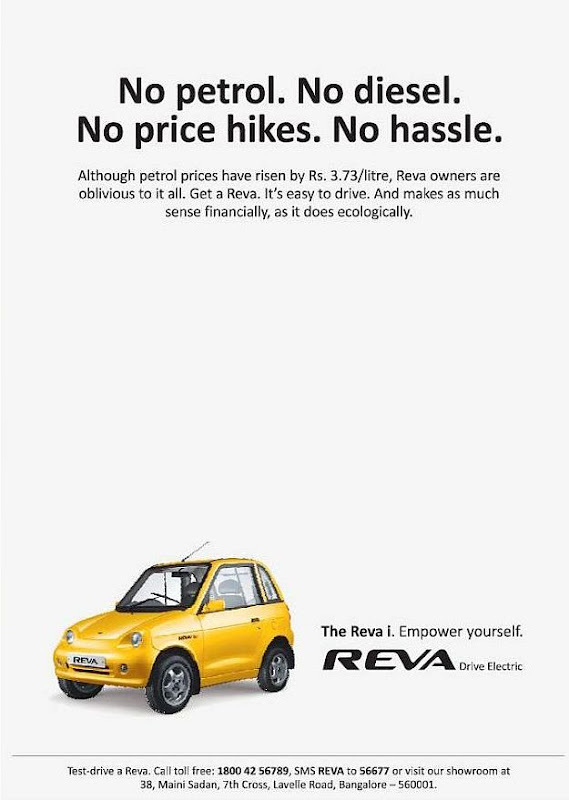 I’ve noticed that whenever there’s a petrol price hike, there will be an ad for the REVA in the paper, boasting its petrol-free prowess. While it’s popular with the eco-friendly set, it doesn’t have a lot of takers. It’s small. And expensive for it’s size. Those who can afford a car would like a big car. But the Reva produces no exhaust, is easy to park, and is apparently dent-proof. And of course, it's petrol free! I'm not sure if it's true, but I heard about a sorry case of some lady traveling around in her Reva with a driver ! Hilarious ! A note about the supposed eco friendliness of these cars. If you consider the amount of fuel/coal it takes to produce 1Kwh of electricity + energy loss through power lines + electric engine efficiency etc ... you realise that on a global scale, the electric car requires more fuel than a normal car. So its global carbon footprint will be higher. The electric car doesn't pollute here. It pollutes there only (where the power plant is). Good to know about the techies using the bike. May their tribe increase. Most of my friends back home drive this....and they are pretty happy with it. Are you the proud owner yet?